Lady GaGa live in L.A.: EW photo blog! Pop ate the Wiltern in Los Angeles Friday night, thanks to the post-post-post-modernist stylings of dance sensation Lady GaGa, her backpack-wearing backup dancers, and an audience so prepared to match their hostess in sartorial experimentation that it made Rocky Horror look like cotillion. One presumed the Lady approved — and somewhere, to be sure, Andy Warhol stirred in his grave. 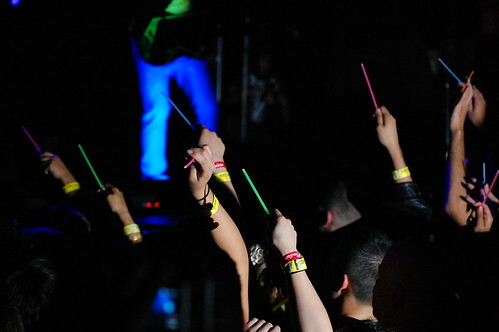 Glowsticks came courtesy of The White Tie Affair, a bouncy nu-punk band that dared to throw an acoustic guitar into the proceedings while battling through a tough opening spot. They sweated it out under the blacklights as best they could, but all those girls in the exotic tights and hair bows (and the club boys who accompanied them) were there for one thing only: the 22 year old self-proclaimed artist whose superhero visage soon splashed huge on a kabuki curtain in front of the stage. A short film played, a voice purred, “My name is Lady GaGa, and this is my house,” and in a blaze of video flame, she appeared. Her wig is now an austere blonde bob, and her stage show just as carefully crafted. DJ Space Cowboy spins from a distant back corner; set/costume pieces are angular and clean. Her onstage banter was at times a bit silly (“I travel the whole world, and when I come home, I can still smell the stench of greed”) and the visuals occasionally lacking in coherent theme, but her voice was strong and refreshingly free of overbearing tracking vocals. For all her cocky bluster, perhaps the most undeniable aspect of GaGa’s talent is this: The girl can, and does, sing. From the back of a packed house, it was mostly impossible to see the teensy tyro — interested parties will likely be able to catch the whole thing on YouTube tomorrow, based on the number of view-blocking cameras in the air — but when you wanna just dance, all you need is the music, anyway. 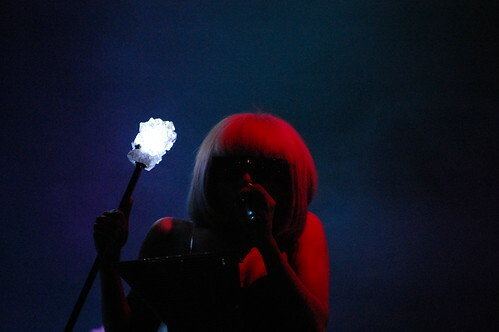 GaGa devotees, prepare to be delighted when her disco stick lights up your town. 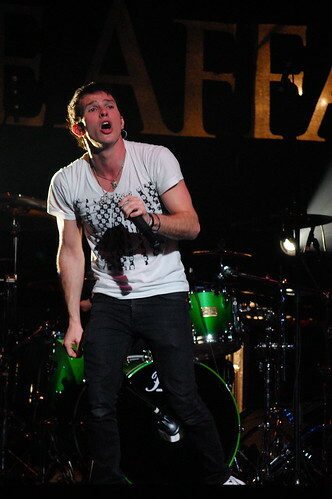 After the jump: Photos from the Fame Ball, night two. And for the uninitiated, a quick GaGa primer from our pages.